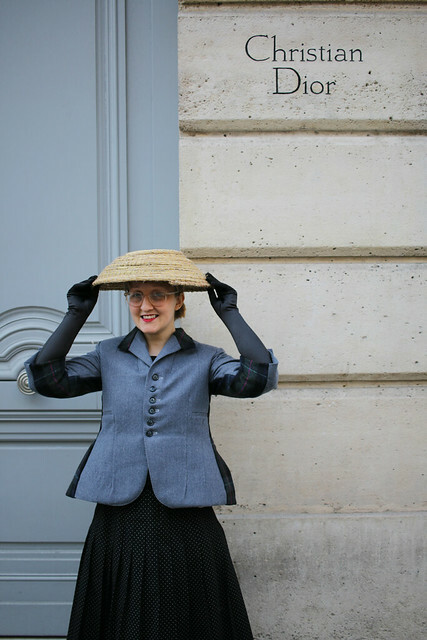 This is my third and final blog post about my outfit for the Refashioners 2018, which was inspired by Dior’s Bar suit, focusing on the process of refashioning a hat. 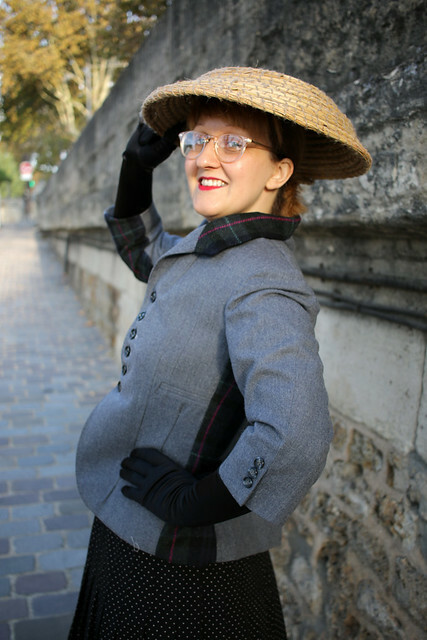 A number of hats were paired with the Bar suit when it was shown in the 50s, and in photographs since, but I wanted to recreate the hat from the photo which inspired this refashion (more info in my original blog post). 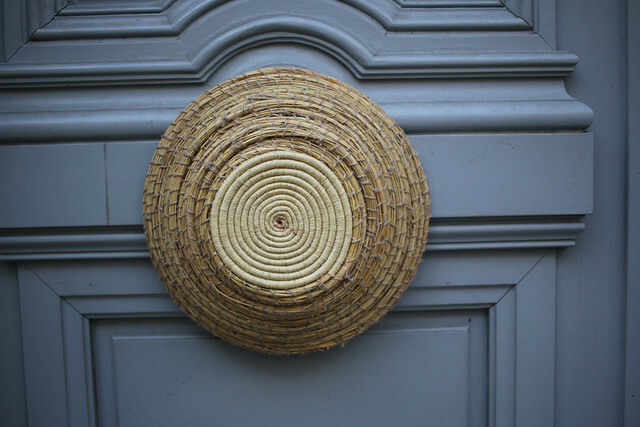 The inspiration hat was made of straw, and seemingly had a flat circular area at the top, and a wide, slightly curved brim. 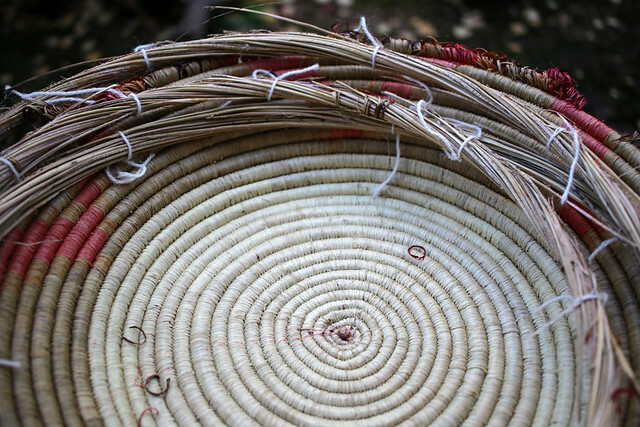 Given the ‘basket’ style of the hat, I decided that my best bet for a second hand material for refashioning was a woven bowl. I spotted the bowl above in the window of a charity shop while on holiday with my family in Dorset and decided to give it a try. 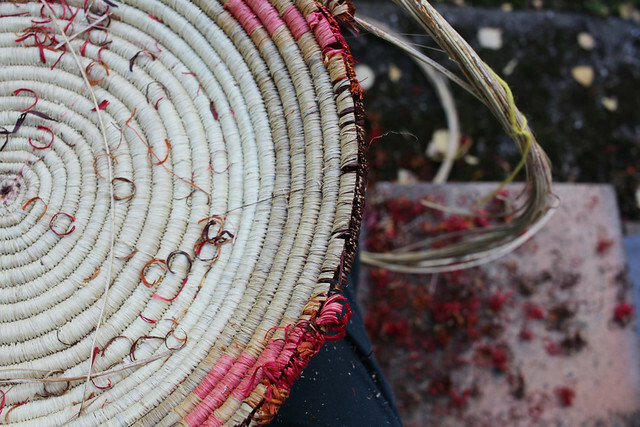 You can see from the images above that the original bowl was too large, flat, multi-coloured, and also far, far too heavy, to be used as a hat without refashioning. 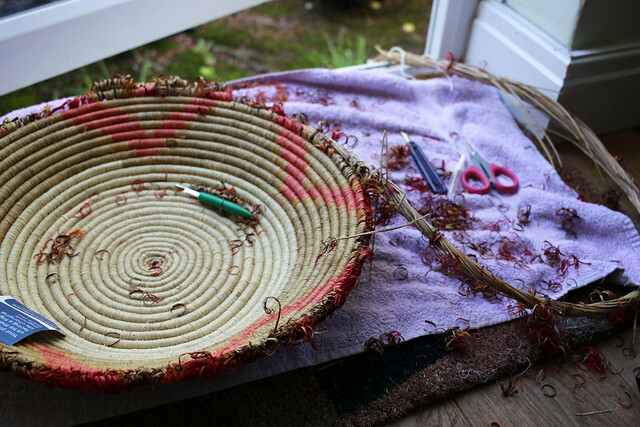 Once home from Dorset, I took a stitch-unpicker to the bowl. A stitch-unpicker was the ideal tool, but due to the thickness of the material I did break at least five before I finished unravelling it. 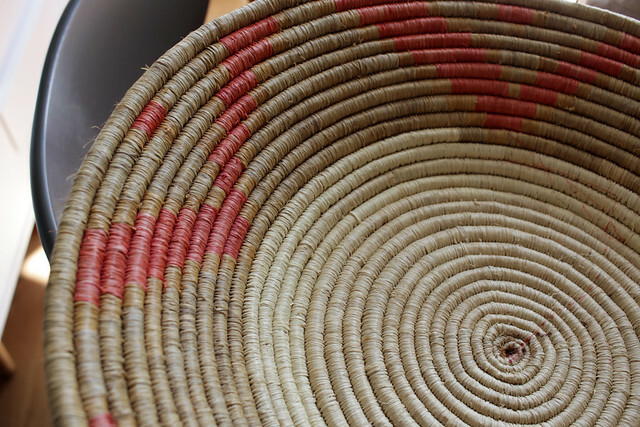 The trick to not breaking the stitch-unpicker was to keep it as flat as possible against the side of the bowl, but it was easy to forget, lift it up slightly and snap the blade. 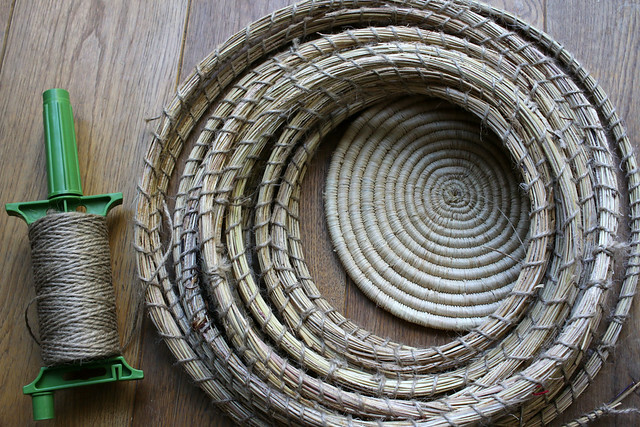 As you can see in the photos above and below, the bowl consisted of long strands (of straw or similar) which were bound into a bowl shape with lots of small curls of raffia (or similar material). 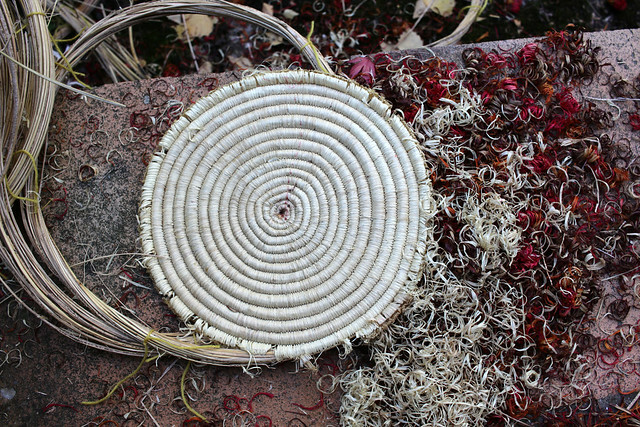 I cut through and removed the curls, released the long strands and loosely tied these together, until I reached a point where I had a small circular base remaining which I thought would serve as the top of the hat. 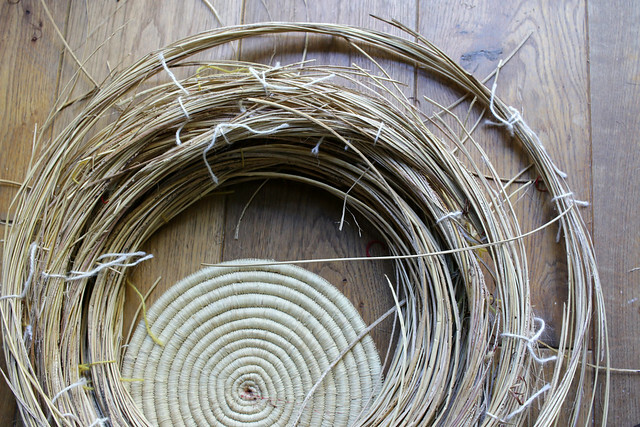 With the bowl sufficiently deconstructed, I bound the long strands with garden twine to give structure and create a long curved material which would form my hat. 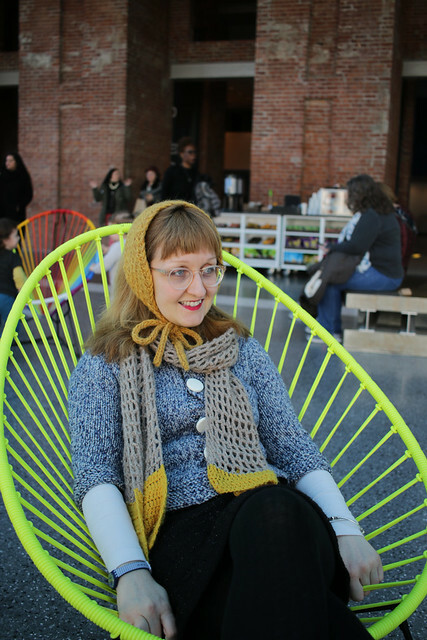 I then threaded more twine through a knitters needle and used it to sew (through the existing twine) the hat together. After that, it was just a matter of trying the hat on and altering accordingly; I made a number of tweaks before I was happy with it, including reducing the circumference of the flat circular top of the hat, and removing quite a bit of depth from the bottom. 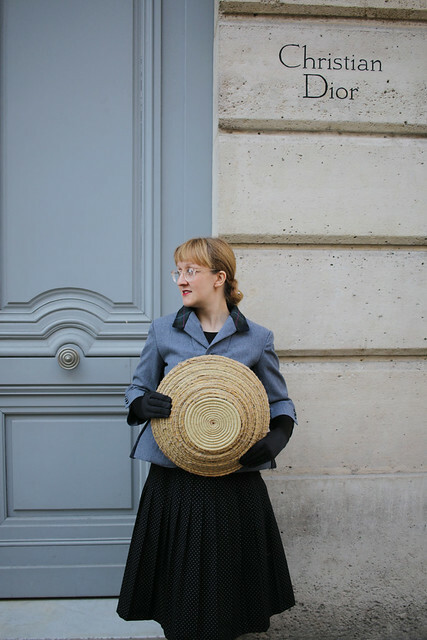 Now that we’re back from photographing the outfit in Paris (photos below), I have put the hat back to work as a bowl (which it still works as, thanks to the flat base)! 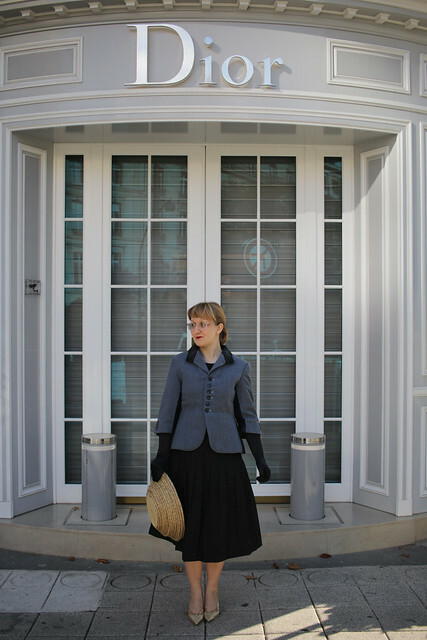 The jacket and skirt fit into my daily wardrobe, and the shoes and petticoat will also be worn although less frequently. I’m pleased that I was able to make a dramatic outfit, but also that it consisted of components which will get regular use. 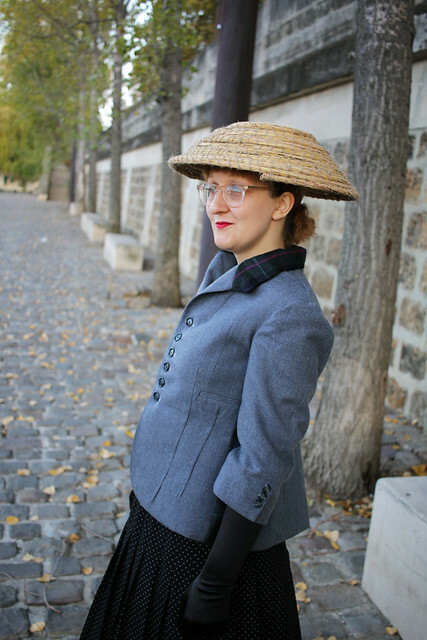 Categories: Sewing | Tags: #therefashioners2018, #vintagepledge, 1950s, 2018, 50s, bar, Dior, hat, Paris, refashion, refashioned, refashioners, retro, sew, Sewing, vintage | Permalink. I wanted to go into more detail on the process of creating a Bar suit jacket as part of my contribution to The Refashioners 2018. 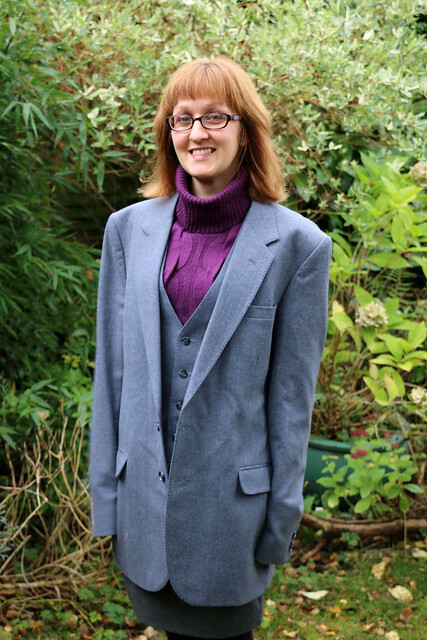 As mentioned previously, my starting point was a second-hand men’s suit jacket purchased in a local charity shop. The jacket appealed as it seemed to be a nice quality, and had labels inside stating that it was made in the UK from British wool. 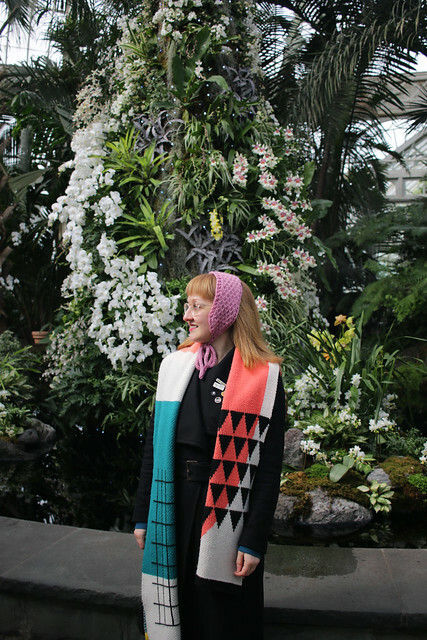 Clearly it differs from the inspiration in terms of both colour and material (the original Bar jacket was made in silk), but I thought a wool jacket would make for a more wearable end result. 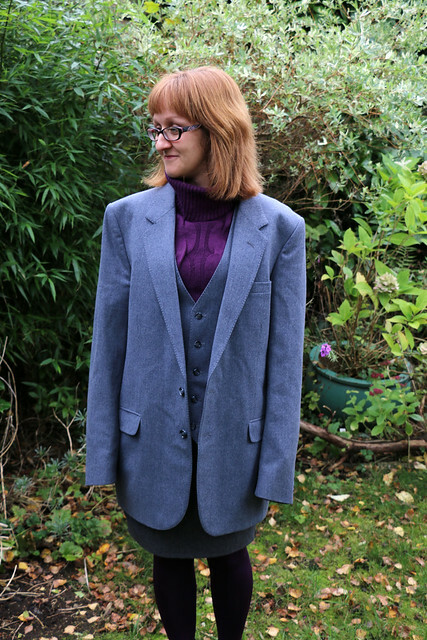 Although the original jacket looks huge on me, I had very little excess fabric to play with, so used some blue tweed British wool from my stash (purchased from Beyond Measure) for the contrast side panels and collar. Given that the original suit was made from British wool, I thought that this would be a suitable pairing and also add some interest in terms of colour and texture. 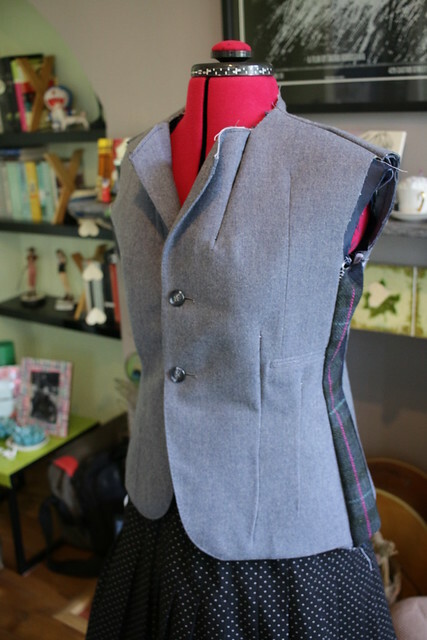 I do think the end result looks like a very British interpretation of the Bar jacket, possibly due to the tweed! 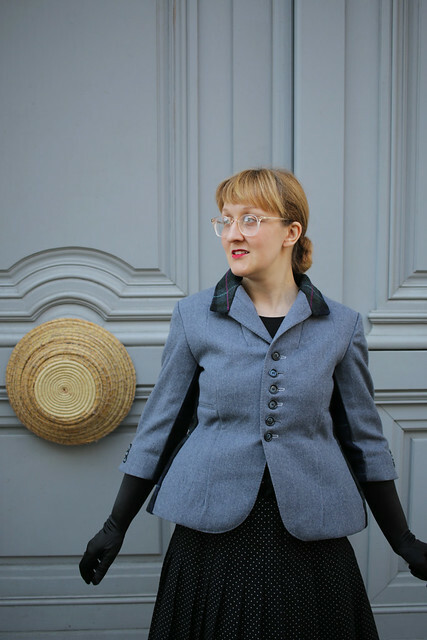 In order to achieve the Bar jacket shaping I used Gertie’s Butterick pattern #B5962 as my starting point. 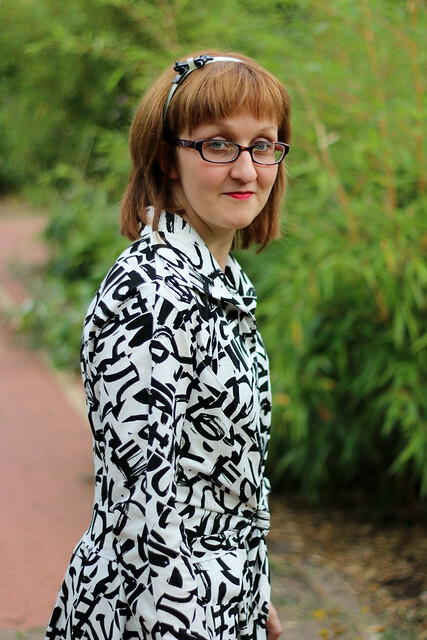 A word of caution for anyone interested in my thoughts on this pattern, because I was working with an existing jacket, as opposed to fabric, there were lots of patterns pieces I didn’t use (including the collar, facing and lining pieces), and there were other pieces (i.e. the jacket front) where I only used the pattern pieces to help estimate where to cut or add shaping. I did find that the B5962 pattern contains a lot of ease and I wonder whether Butterick included a standard outerwear level of ease, when a very close fit is clearly needed for this style. Based on my measurements, I originally graded between sizes 10 (bust) and 12 (waist/hip), however it turned out huge so I went back and reduced the top of the jacket (down to the waist line) to a size 8, grading to a 12 below the waist for added volume in the ‘peplum’ section. I also found the shoulders too wide on me so trimmed off 1.5 cm at the sleeve head, grading down to 1cm. I still think there is a little too much ease in the centre back, but I was way too far along to remove this before I noticed. I managed to retain quite a few features of the original men’s jacket. 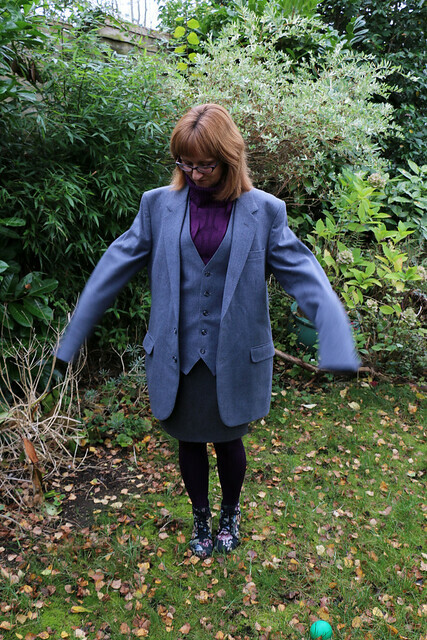 For the jacket fronts, I used the B5962 pattern to estimate where to cut the inside seam, armhole and shoulder seam, plus where to add shaping – meaning I retained the original hem and front, including buttons, buttonholes and part of the collar. 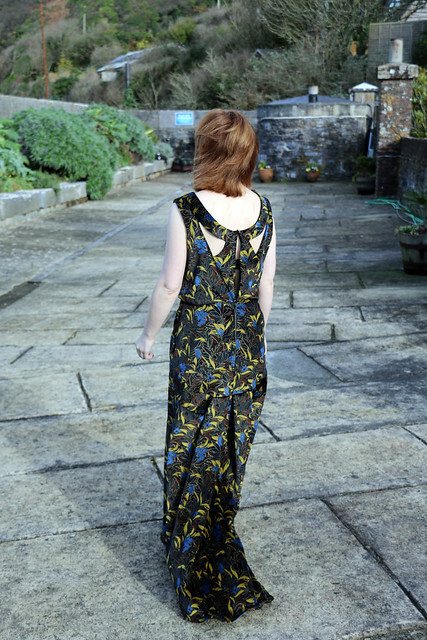 Similarly I retained the existing hem on the back of the jacket (including the back vent), and on the sleeves. The buttons on the sleeve are original, and amazingly I managed to identically match the original buttons on the front (in John Lewis) to increase the number of buttons from two to six. 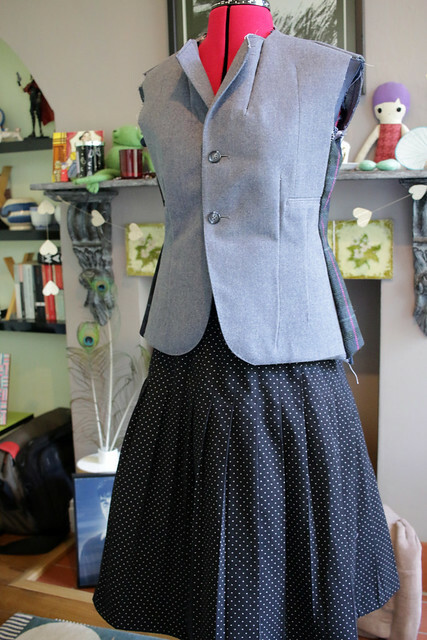 I was initially intending to retain the original collar but decided it looked a little bit dull, so retained the sections on the jacket front and used the remainder of original collar to cut a new version in blue tweed. 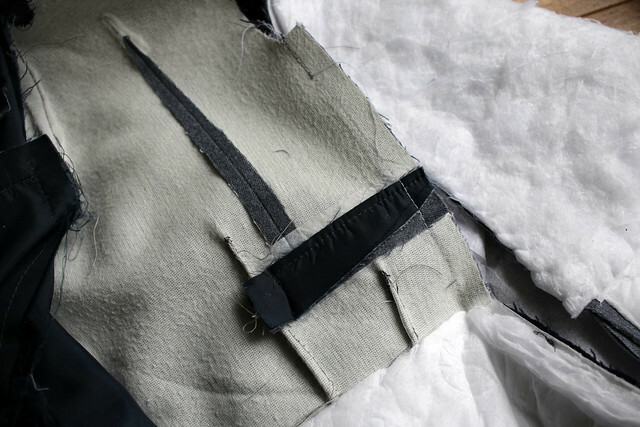 An awful lot of the time I spent on this jacket was spent on the insides – determining where to add, and where to remove, interfacing and padding. The jacket fronts were already backed with a lightweight fusible interfacing, but strangely the back wasn’t. 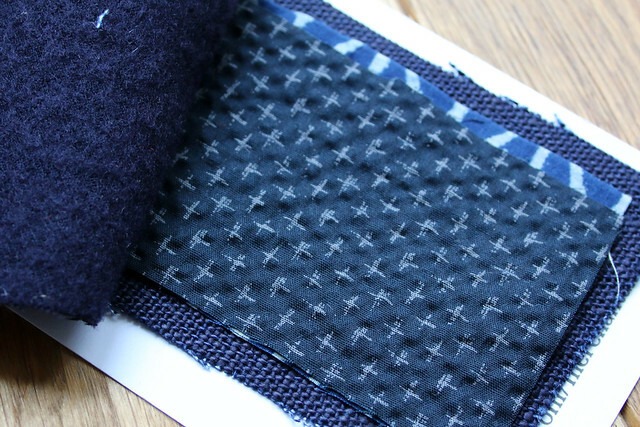 I added a similar weight interfacing to the back of the jacket, and a heavier weight on the added blue tweed sections, since the tweed was much drapier than the original jacket fabric. I removed strips of canvas which were shaping the original collar and neckline, added shoulder pads, and I added padding (thinsulate, since that is what I already had in my stash) to the peplum section of the jacket to try and add body. Gertie’s B5962 pattern attempts to replicate the Bar silhouette through a combination of long darts, and through the use of side panels. Having studied images of Dior Bar jackets, I believe that each jacket front is actually constructed of two panels, and I think these are needed to create the really dramatic Bar silhouette (the B5962 pattern uses darts in a similar position instead). There are less images online of the back of the Bar jacket (some good images here), but it also appears to be constructed from multiple panels (the B5962 back is constructed from two). It would have been difficult to retain as much of the original jacket if I had been attempting to recreate the Bar jacket more closely, but I would be interested to try a more faithful recreation at some point. I had read online that hip padding would have been worn under the New Look outfits, to create the required shaping at the hips (see here for a video and here for a related sewing pattern). I decided to try and create some hip padding the evening before we left for Paris, and visited the £1 Shop to see what suitable supplies they might have! I found a pack of three sponges for £1, strung them together on some yarn (I sewed through the middle of each sponge), and tied it around my hips. 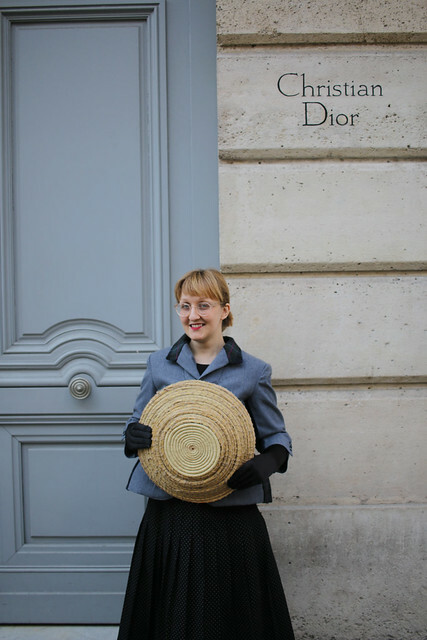 I’m wearing my ‘hip padding’ in the pictures below (outside the Dior building with the blue door). You can see it does create a more exaggerated peplum effect, but I decided I preferred the silhouette without so I’m not wearing it in the other images. P.S. 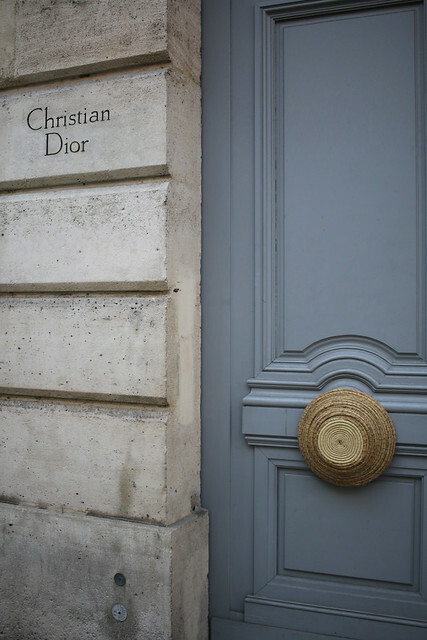 these images outside Dior (above and below) were taken around the original Dior studio at 30 Avenue Montaigne, founded by Christian Dior in the 1940s. This outfit has occupied almost all of my sewing time for the last month, and I’m really proud of what I achieved, both in terms of overall effect and my ability to bring my plans to life. 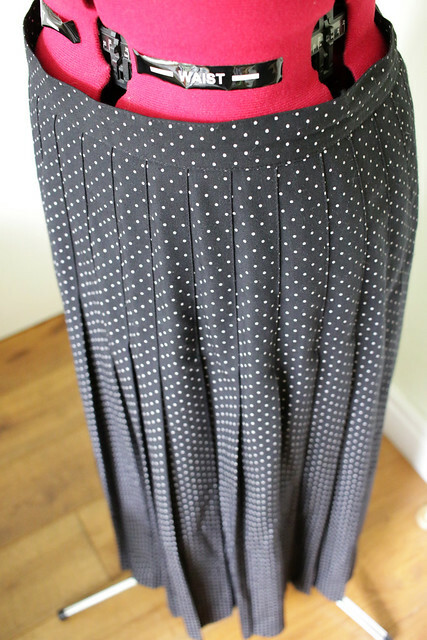 I definitely think that basic refashioning (like the skirt, which I simply reduced in length) makes for a quick, satisfying sewing project, well suited to a beginner. 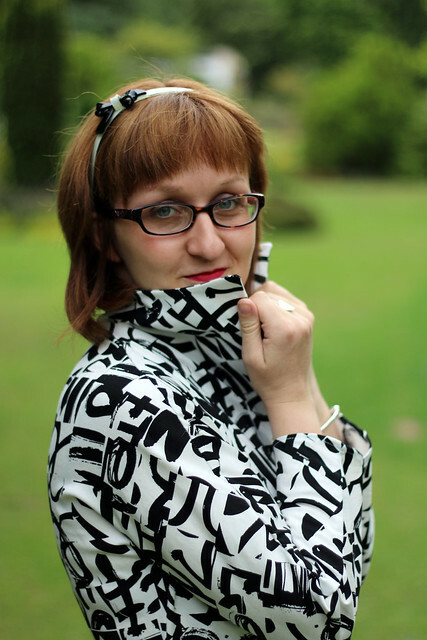 However, I think that dramatically altering a garment (like the jacket in my refashion) can be significantly more complex and time consuming than sewing with fabric. 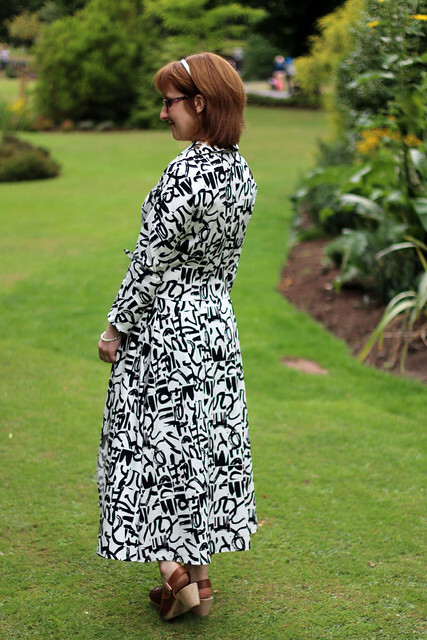 This type of refashioning makes for an interesting challenge, but I don’t think I would have completed this jacket with less years of sewing experience under my belt. It’s definitely a indication, to myself, that my sewing skills have reached a point where I am able to interpret what isn’t working, and how I might resolve it, as opposed to needing to rely solely on instructions (although nice simple instructions are still very nice!). 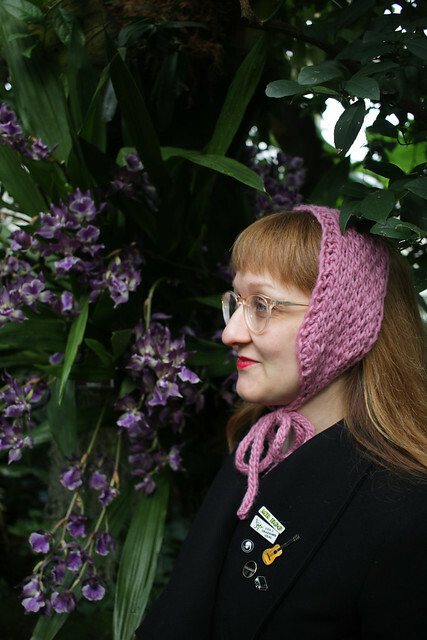 I have one further post to share with you about this outfit, about how I made my hat. Categories: Sewing | Tags: #inspiredby, #therefashioners2018, #vintagepledge, 1950s, 2018, 50s, b5962, bar, butterick, Dior, gertie, Paris, refashion, refashioned, refashioners, retro, sew, Sewing, vintage | Permalink. When I saw that the theme of the Refashioners this year was ‘Inspired By’, there was only ever one garment I was going to make. I love visiting fashion exhibitions and have lots of fashion reference books, and there are brands (Biba) and decades (30s-40s) that I’m fascinated by, but there are only two actual garments which I love inordinately: Scarlett O’Hara’s curtain dress & Christian Dior’s Bar suit. I’m a huge fan of the Refashioners and devour the blog posts every year, but have only participated once before (the 2015 men’s shirt challenge). My project for this year actually started with last year’s men’s suit challenge, and I’m very happy to have brought it to fruition a year later. (I still have a selection of jeans – old ones Phil was chucking out – from the 2016 challenge which will also eventually get refashioned). This time last year I was in a hectic period at work and had decided that I wasn’t going to add to my to-do list/stress levels by taking part in the Refashioners, but then I popped into a charity shop during one lunch break and came away with a British wool suit, made in the UK, which was too good to resist. 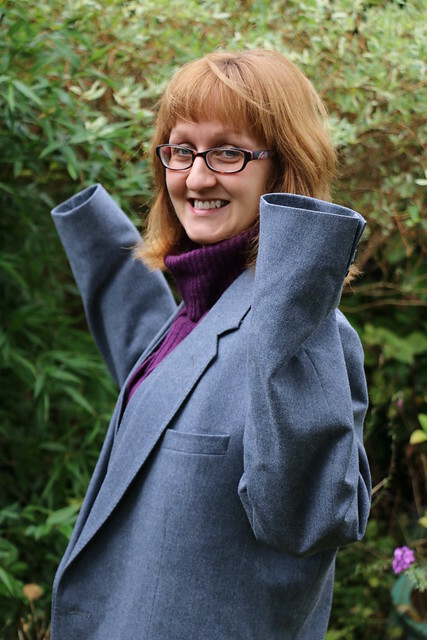 The suit consisted of a jacket and waist coat. I posed in it for the pre-refashion pictures below last year, and Phil told me that I looked like three children stood on each other’s shoulders trying to buy alcohol. I always intended to refashion the jacket into a version of Dior’s Bar jacket and I made a first attempt at fitting the body last year, but it turned out way too large and I had no time to fine tune the fit, so the jacket ended up hanging on my wardrobe door for a whole year. When Portia announced the theme of this year’s Refashioners, I knew it was time to return to the jacket – and to go a step further and try to recreate a whole ‘look’. My favourite (and also the most famous) photo of the Bar suit was taken in 1955 (or possibly 1957) by Willy Maywald, modelled by Dior house model Renee, and shot in Paris (more on that later). 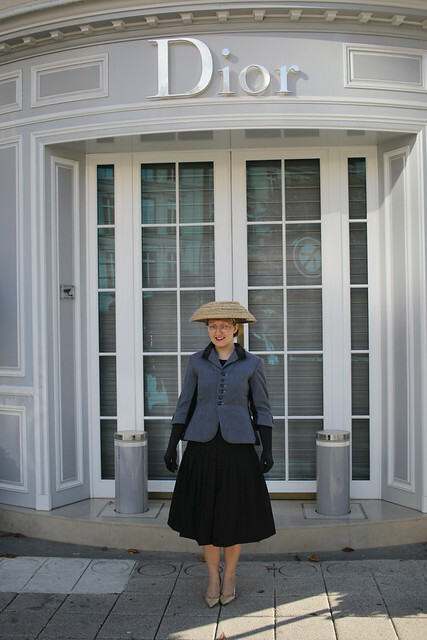 As you can see from the original photo below, the full outfit consists of the Bar jacket, plus skirt, gloves, hat, and shoes. 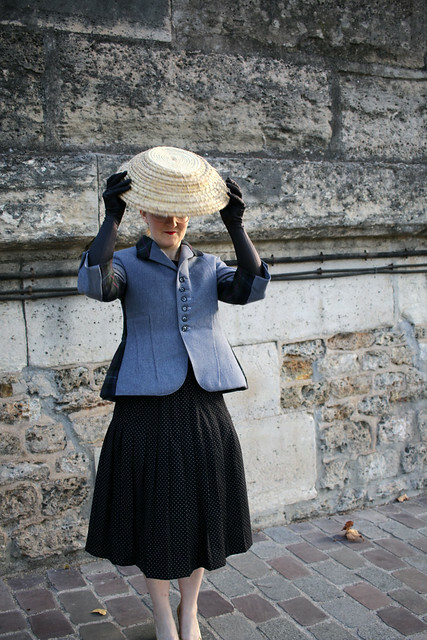 I’ll go into detail, but for information I refashioned a jacket, skirt, petticoat and hat. My gloves were new as I couldn’t find suitable second-hand gloves in a local charity shop and didn’t want to pay what was being charged online. 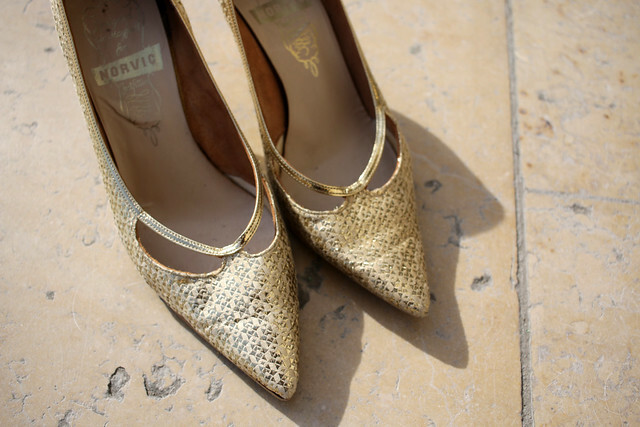 My shoes were second-hand and are 1950s originals purchased on eBay (for £30). Once I had decided to recreate the outfit in the photo, I set about finding the other components. 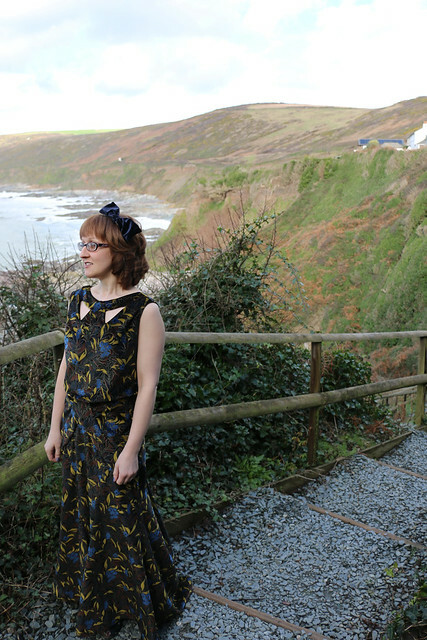 I found a suitable skirt (shown pre-refashion below) during another lunch break charity shop trip. The skirt met my criteria for a black pleated skirt and, as an added bonus, already fit me at the waist. To modify the skirt for my refashion, I simply removed 6 inches from the bottom and turned it up by another 2 inches to create a nice deep hem. 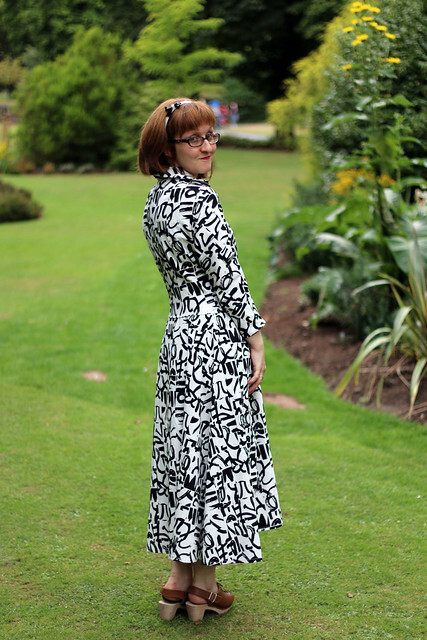 To give the skirt volume, I used an existing petticoat I bought on eBay years ago but have rarely worn, partly because the shaping never seemed quite right. 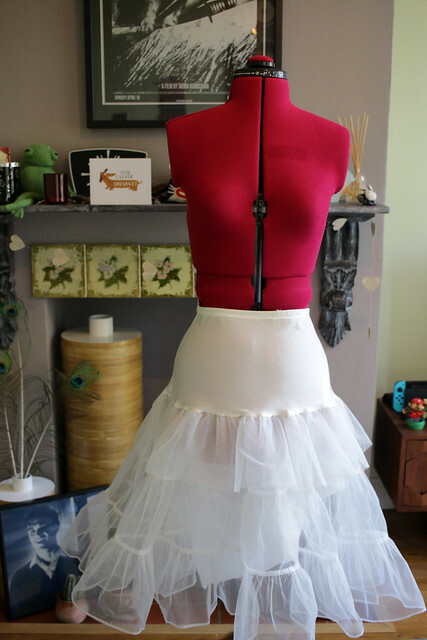 This project finally convinced me to take my scissors to the petticoat and alter it to my liking – which was as simple as reducing the length of the top layer of tulle (the picture below shows the petticoat after I’d taken my scissors to it). While we’re on the topic of undergarments, the minuscule waist in the original photo suggests a corset, but I had no desire or intention of trying to reduce the size of my waist. The hat was a bit more of a puzzle. 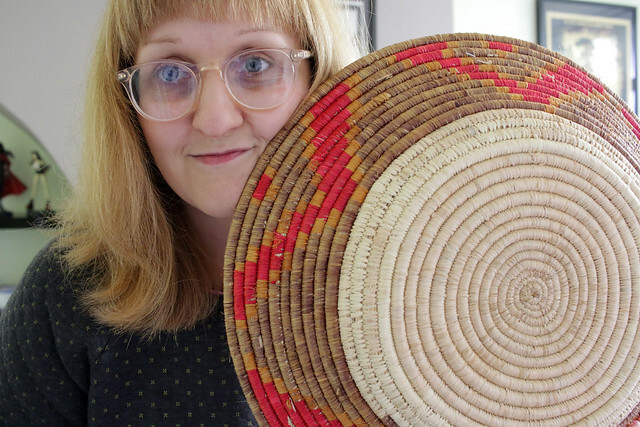 If I had been starting out with new materials, I would have been tempted to try crocheting a hat out of raffia (inspired by Emily’s bag), but there was no way I was going to find raffia suitable for crochet in a charity shop. 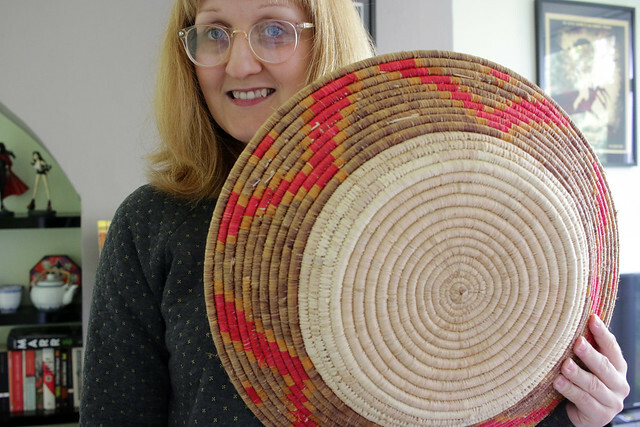 I decided my best bet was to look for woven bowls, and spotted the bowl below in the window of a charity shop while on holiday with my family in Dorset. 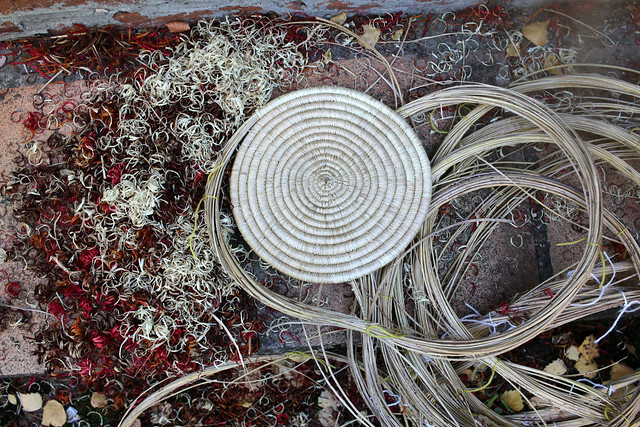 As you can see from the photos, a refashion was in order since the bowl was too large, flat, colourful, and far too heavy, to use as a hat in its original form. 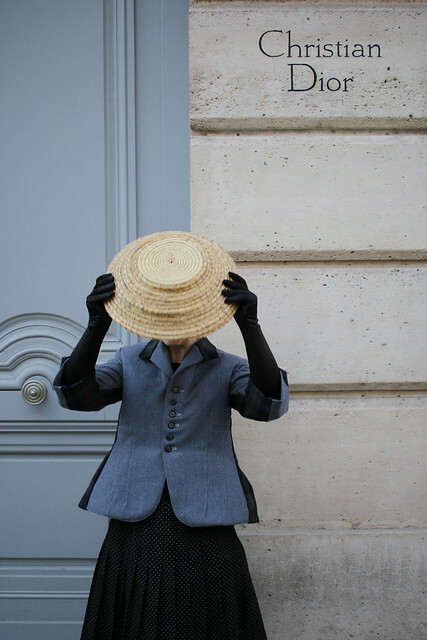 Once all components of the outfit were ready, one further element was required to recreate my inspiration image – location. I knew that the original Willy Maywald photo had been taken in Paris, and could tell that it had been taken along the Seine, so Phil and I decided to take a trip to Paris to recreate the photo! This wasn’t quite as extravagant an act as it sounds (well maybe just a bit), as we’d been talking about taking a short break and the photos decided the location for us. We took the photos on a Sunday morning, and on the previous Saturday night Phil and I walked along the banks of the Seine for a couple of hours looking for a suitable spot. We determined that the original photo had been taken on one of the ramps leading down to the Seine from the path above. We became extremely picky with our comparison of these ramps against our criteria (height of wall, cobbled, wide pavement, trees either side, etc.). We didn’t find a ramp which looked exactly like the ramp in the original photo (it my still be out there somewhere…), but we did pretty well. 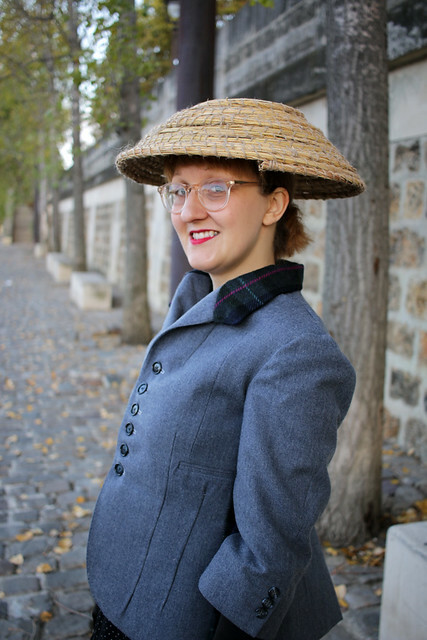 To avoid writing an epically long blog post, I’m going to discuss the details of my jacket and hat refashions in a separate post or two, and finish here by revealing my finished outfit, photographed beside the Seine. 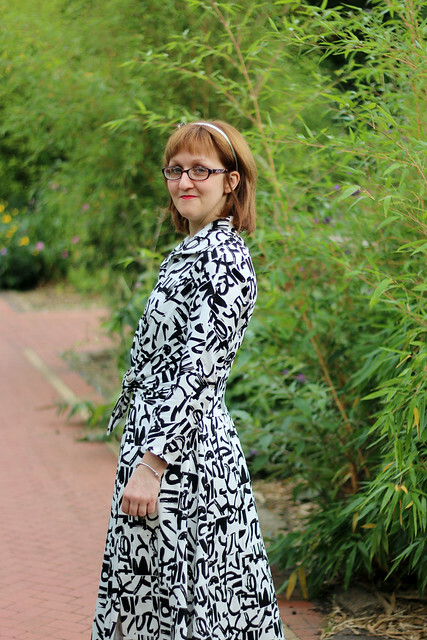 For reference, I used Gertie’s Butterick pattern #B5962 as a starting point for the jacket, but very much working with the existing features where possible. Categories: Sewing | Tags: #inspiredby, #therefashioners2018, 19050s, 2018, 50s, b5962, bar, butterick, Dior, gertie, makery, Paris, refashioners, retro, sew, Sewing, suit, vintage | Permalink. So here’s a dress that was long in the planning! Two years ago, my brother James announced his wedding. Not long before that, McCall’s had released M7154, a 1930s reproduction pattern. I loved M7154 on release and when the wedding was announced thought it was the perfect excuse to try the pattern. 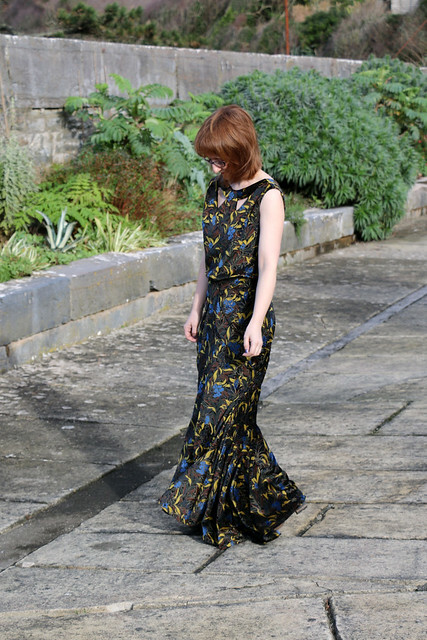 Despite having two years advance warning (and the pattern in a drawer for that time), I, of course, waited until a few weeks before the wedding to make a start on my dress. I actually did the majority of the sewing in the week before the wedding, in the evenings after work. I finished the hem of the dress on the morning of the wedding, along with finishing touches to a wedding jacket for my brother and his wife’s dog, Rupert… I was staying at the venue, and had my bedroom set up as a sewing room, with machine and sewing supplies spread across the dressing table. 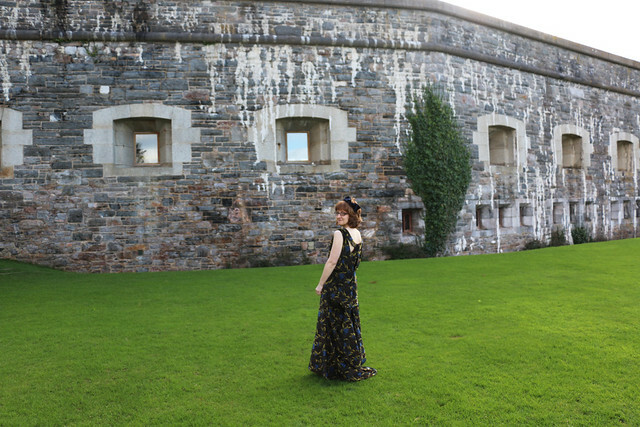 The wedding venue was a fort on the Cornish coast, which you can spy in the background of my photos. 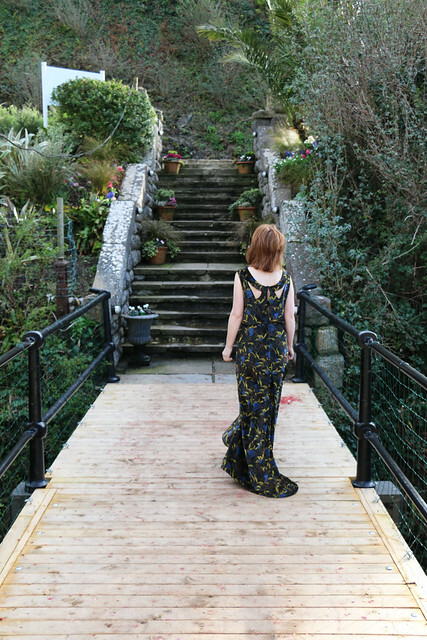 It was a beautiful wedding and we had a lovely weekend, and even decent weather for February – with the exception of during the official photos, when it poured! My fabric is a floral velvet purchased from Barry’s Fabric. Barry’s have a small rack (near the till) which contains a selection of fabrics which are kept out back (mainly velvet and fake fur), presumably due to a combination of price and the space the bolts take up. Phil was wearing a purple suit to the wedding, so I started off attempting to buy a purple or pink velvet for my dress. 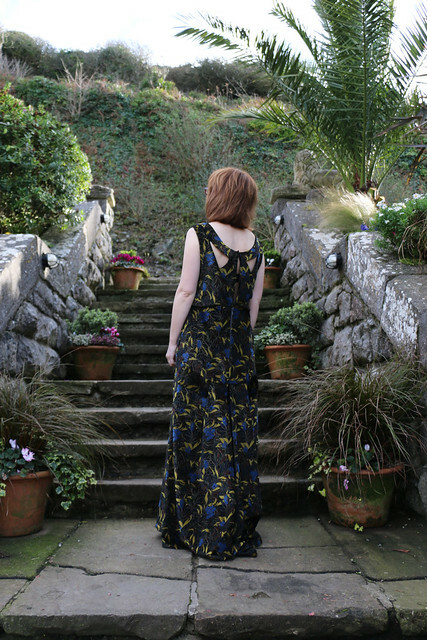 However, due to needing five metres, available options were limited – I had the staff in Barry’s back and forth checking pretty much every velvet on the rack… I love the fabric I did come away with though – and I have a little left to make something more casual, given the impracticality of this dress. Initially the bodice hung very low. I raised it by unpicking the bodice at the shoulder seams and trimming off approximately 2 inches from each of the four straps. I cut approximately 4 inches off the length at the skirt hem. I also found the instructions for sewing the neckline to the bodice at the front and shoulders unnecessary fiddly, and would recommend following your own common sense on those sections. Photos of what you really want to see from the wedding, Rupert’s dog jacket, to follow! Categories: Sewing | Tags: 1930, 30s, dress, M7154, mccall, sew, Sewing, velvet, vintage, wedding | Permalink. 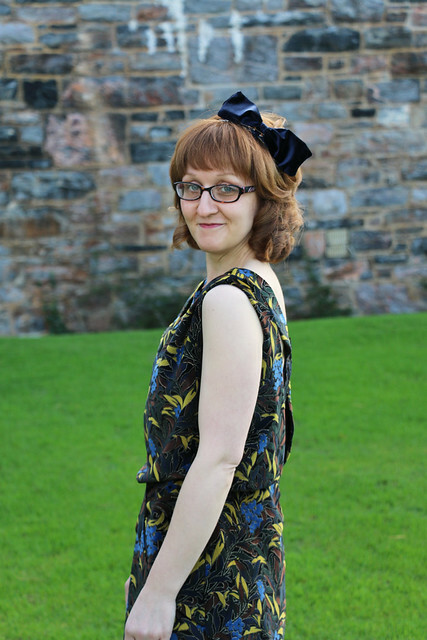 I’m very excited to be sharing my contribution to the Big Vintage Sew-along blogger tour today. Are you taking part? 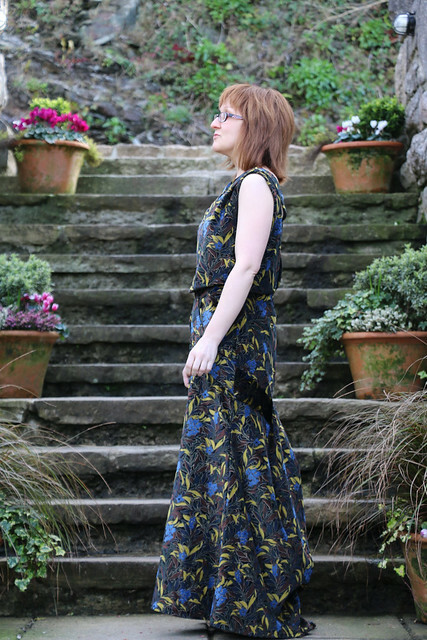 McCall’s have selected twenty McCall’s/Vogue/Butterick vintage patterns, and are donating money from the sale of those patterns to The Eve Appeal gynaecological cancer charity. There’s also a series of events taking place, including an afternoon tea at the Knitting & Stitching Show in October. 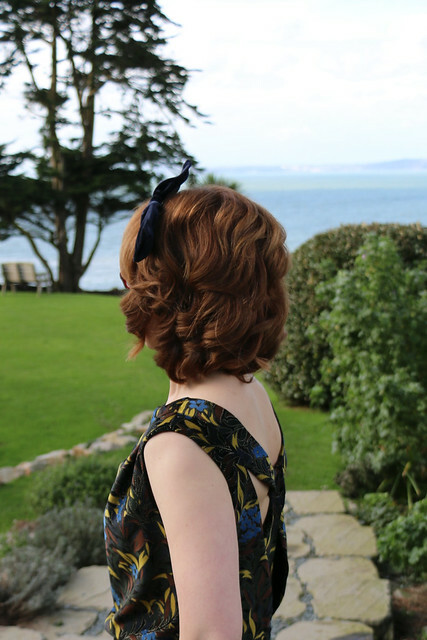 The pattern I chose to sew for the blog tour is Vogue 2401, which (as you can probably tell from the silhouette) is a 1950s’ pattern. I decided on 2401 as I thought it had an unusual (coat dress like) silhouette, and I loved the line drawings (although not the modelled product photo – which is rather naff). I made Version A, the only difference between versions being the sleeve length. 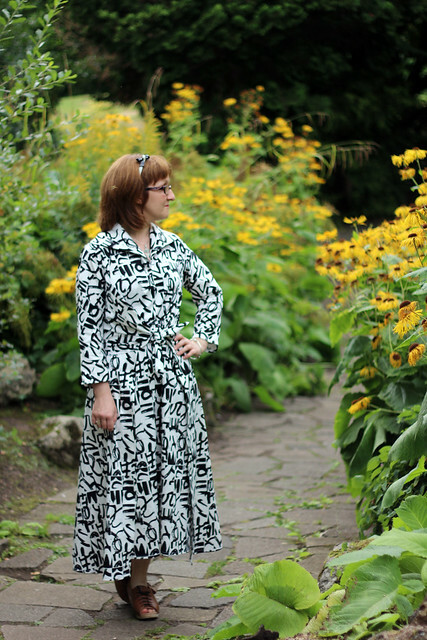 Inspired by the coat dress look, I chose to use a medium-weight fabric. 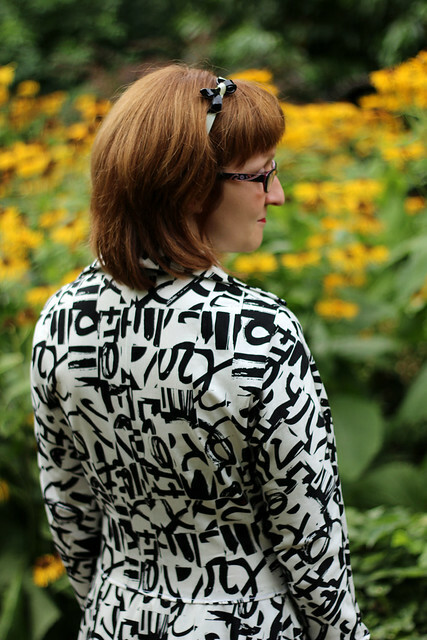 I ordered lots of swatches and took ages making up my mind, but finally decided on this Black and White Graffiti Sateen from The Splendid Stitch. The fabric handled beautifully; I unpicked and re-sewed the bodice multiple times and the fabric handled it like a champ and didn’t fray. 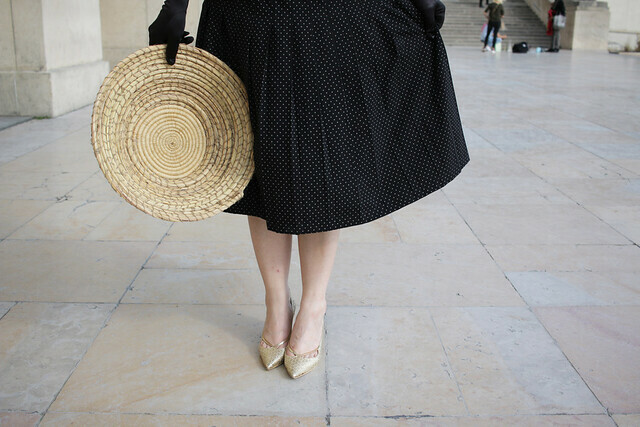 A medium-weight fabric was a good match for the full skirt and structured collar. The only section which would have worked better in a lighter weight fabric are the ties at the front – I’ve tied them in a double knot as otherwise the ends stick up and look a bit unruly. I actually think the tie sections (which wrap from the side of the bodice to the front of the dress) would look great in a contrast fabric – so a lighter-weight, contrast fabric would be perfect for those two pattern pieces. I also think this pattern might work really well in a structured knit fabric. Some of the design details of this pattern are obscured by my fabric choice, and I’m not sure they are particularly obvious from the (quite long) description on the pattern envelope. 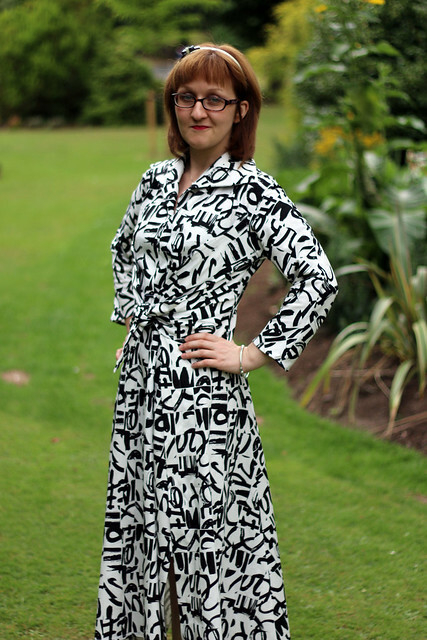 This is a wrap dress; the dress is tight fitting (there are a lot of darts!) on the arms and top of the bodice, but then opens up with a slit along the sides of the bodice (covered by the bodice wrap section) and the skirt. The skirt is constructed separately from the bodice in multiple panels, with the back/side skirt panels overlapping the front skirt panel. 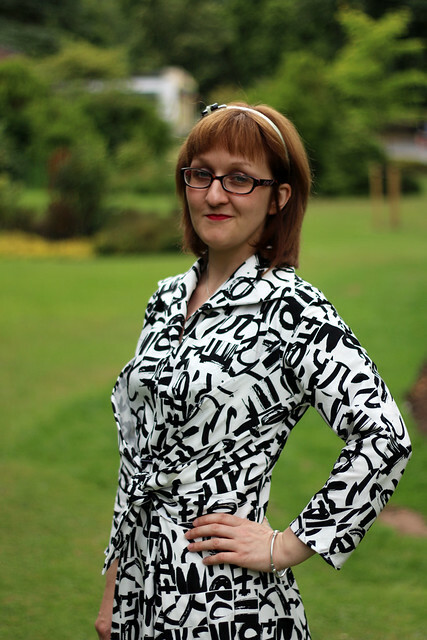 The skirt suffers from a common wrap-dress issue; the skirt panels don’t overlap by very much. 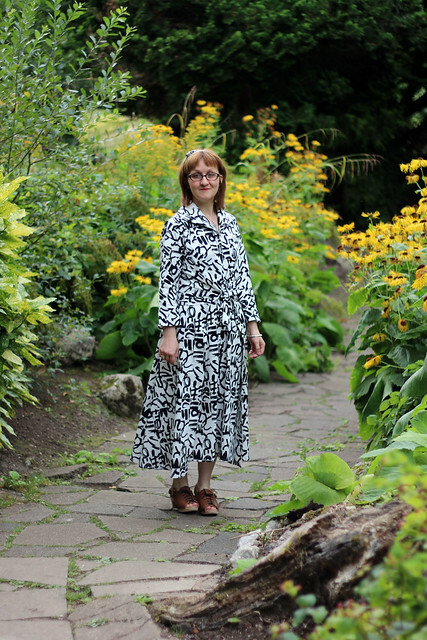 I wore this dress on it’s first outing to the park (Cannon Hill Park, a local favourite) to take these photos and I was flashing quite a bit of leg. I’m planning to either secure the panels to one another or add some additional width to the skirt to address this, otherwise every time I wear it I’ll be constantly checking and adjusting the skirt. I fall between a 10-12 on the pattern sizing chart; because the paper pattern contains a subset of sizes (e.g. 6-10, or 12-16, etc. ), I actually fall between two separate paper patterns. I went with the smaller size (to match my bust measurement), and then roughly graded out at the waist / hips. However, with this dress you actually only need to worry about your bust measurement, as the wrap provides ease at the waist and hips. 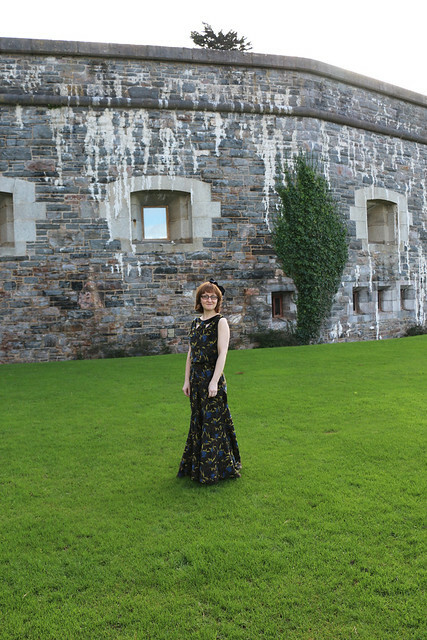 One thing to note – because this dress is very fitted at the arms and upper body, I actually found that to get it on/off, I really needed to drop/lift it over my head with arms raised, rather than putting it on one arm at a time. As such, it’s one of those dresses that is much easier to put on with assistance! The bodice has quite an unusual construction method, which reminded me how accustomed I have become to detailed (indie pattern) instructions. I spent ages puzzling over (and repeating) one step, but I think the step which tripped me up is actually very simple. For anyone else sewing the dress, at the final step on Page 2 of the instructions (attaching the front and side front bodice), I believe that the correct construction requires you to cut into the front bodice up to the marker. However, because the instructions don’t explicitly state this, I tried various alternative methods to make the pieces match up. The only changes I made were to skip the inside belt, which I didn’t think would add much, and interfacing, which the weight of my fabric made unnecessary. 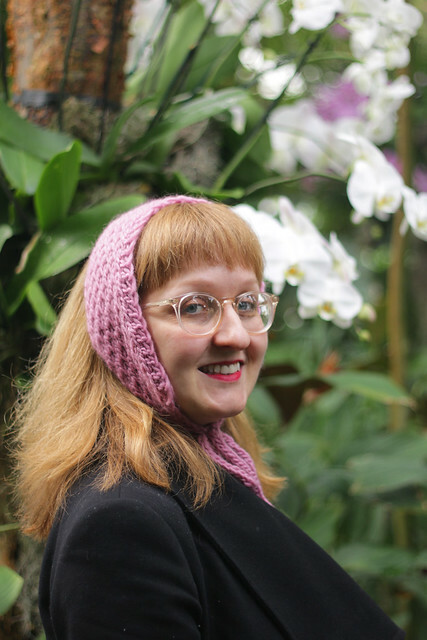 I’m hoping to try a few more patterns from the Big Vintage Sew-along selection before the end of the year. I already have 1940s pattern B5209 cut-out ready to sew, and I’m planning to make 1930s pattern McCalls 7154 to wear to my brother’s wedding in February next year. Categories: Sewing | Tags: #bvsewalong, 2401, big vintage sew-along, dress, graffiti, retro, sew, Sewing, v2401, vintage, vogue | Permalink. 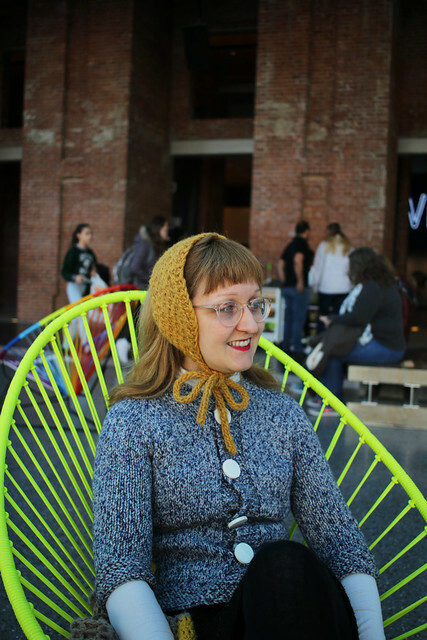 I was delighted to be asked to participate as a blogger in the Big Vintage Sew-along, hosted by the McCall Pattern Company. 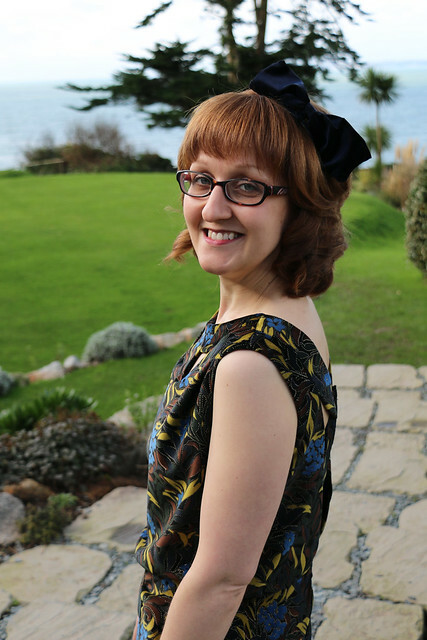 As part of a year-long event, 20 patterns have been selected from the Vintage Vogue, Retro Butterick and McCalls Archive pattern lines. 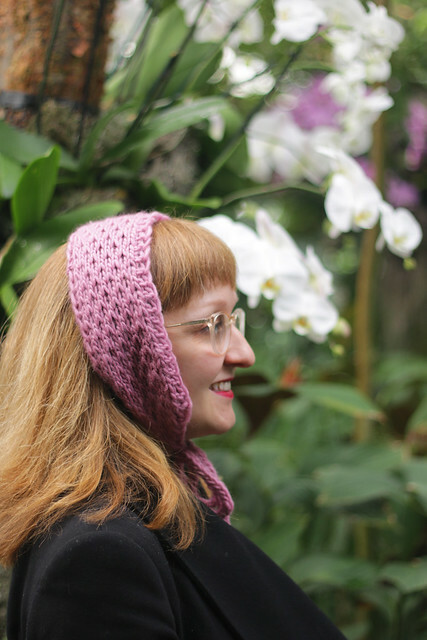 Proceeds from the sales of those 20 patterns will go to the Eve Appeal, a charity which funds research into gynaecological cancers. 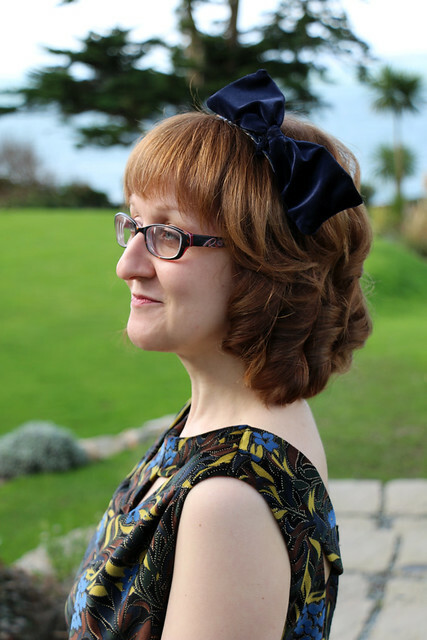 The official website for the sew-along is here, and the Fold Line have posted a round up of the event and bloggers taking part. I’m not revealing which pattern I’ve selected until I blog my project on 19th August, but I thought I’d show you the fabric I’ve picked. 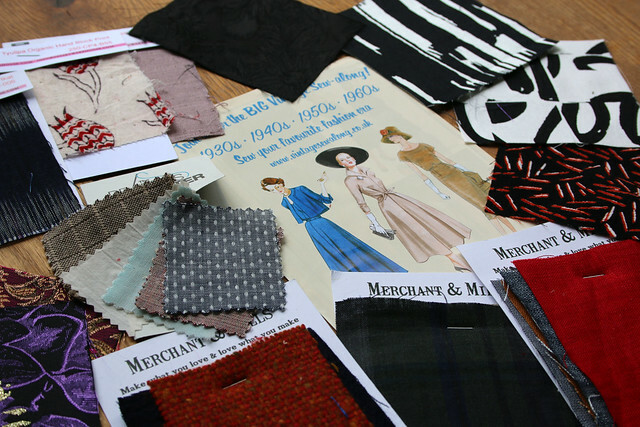 I don’t normally have much trouble choosing fabric! But for this project, I ordered lots of swatches and took ages making up my mind. 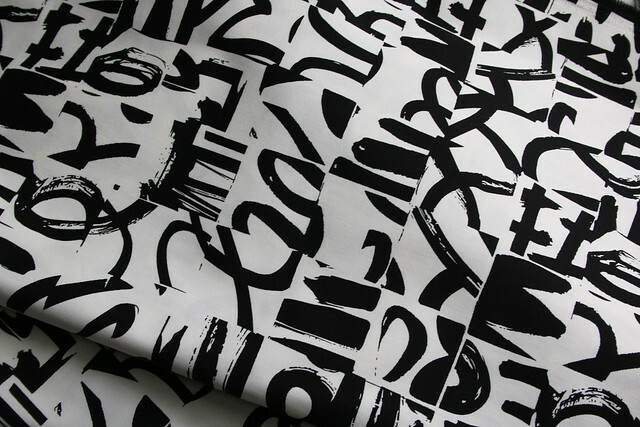 I finally decided on this Black and White Graffiti Sateen from The Splendid Stitch. It’s washed and ready to cut, and I’m really looking forward to seeing how the pattern looks in it – fingers crossed that I do right by pattern and fabric! 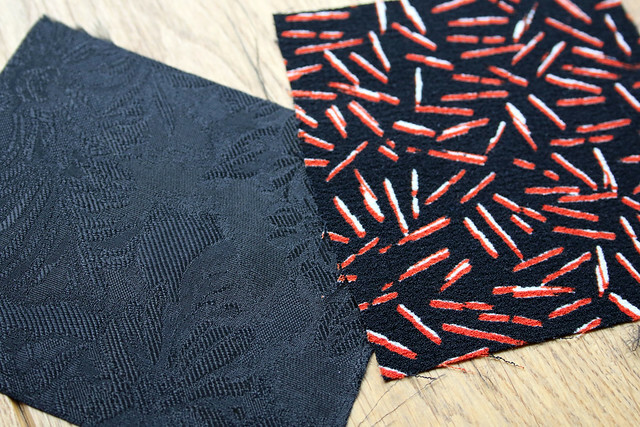 From the Splendid Stitch, I also considered this Black Damask, and Matchsticks Poly Stretch Crepe which I love but thought would be a bit lightweight for the pattern. (P.S. 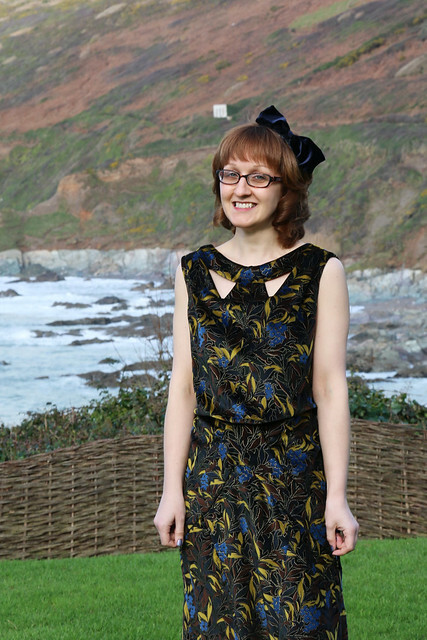 you can get 20% off your first order at the Splendid Stitch with code 1W1N-JL5H-J963 until 17th July). I had originally planned to order this lovely textured Tottorri Cross fabric from Merchant & Mills for my Big Vintage Sew-along project, but it sold out before I ordered! If anyone sees it back in stock let me know as I’d love to try sewing with it. 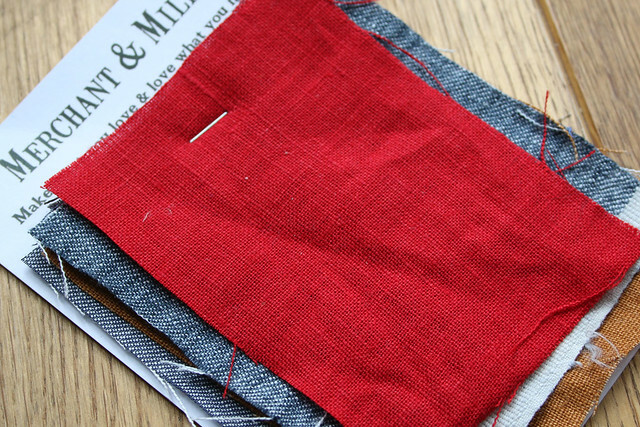 From Merchant & Mills, I also considered (and love) the Scarlet and Blackwatch linens. 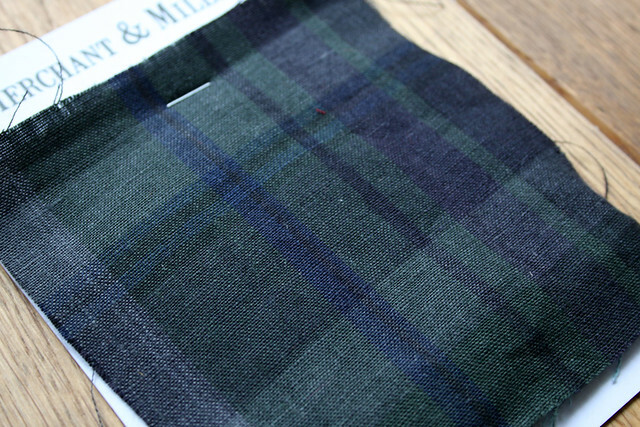 The Blackwatch is 100% Irish linen. 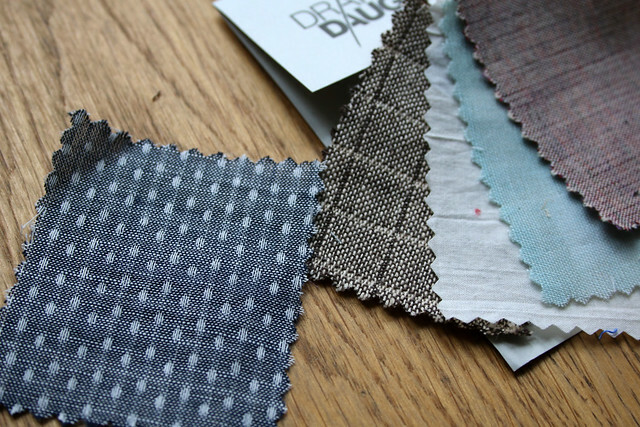 From the Draper’s Daughter, I love the Robert Kaufman Chambray Union Woven Spot. 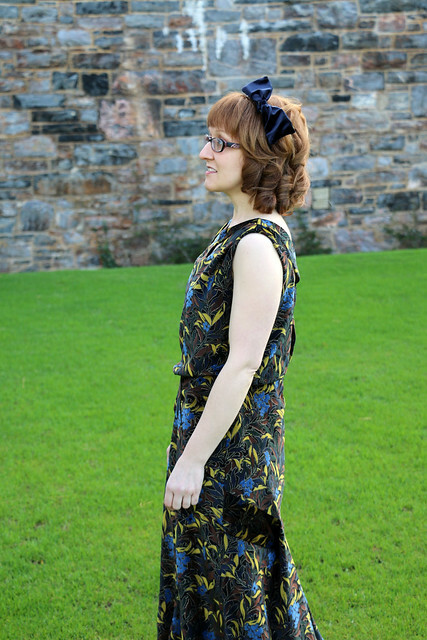 I decided it wasn’t quite right for my Big Vintage Sew-along project, but I definitely fancy ordering some for a different pattern (I’m thinking, perhaps, a dungaree dress). 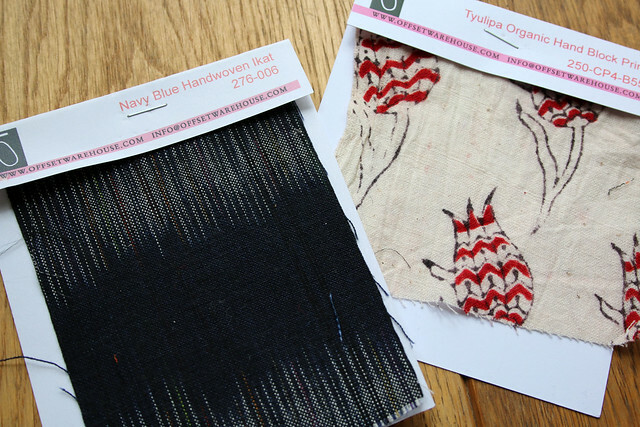 And finally, from Offset Warehouse I considered the Navy Blue Handwoven Ikat and Tyulipa Organic Hand Block Print. 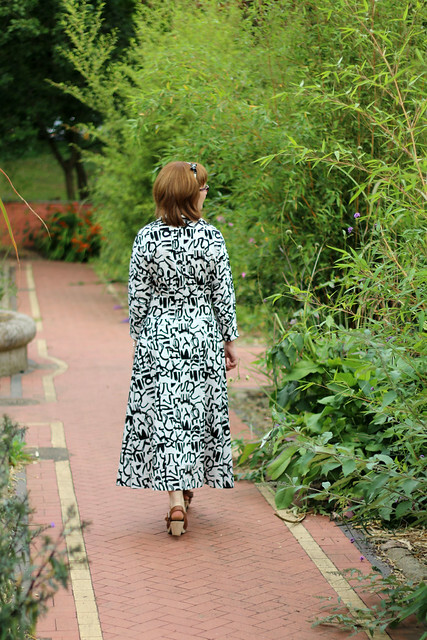 For this project, I was wary about the directional pattern in the ikat, and the weight of the tulip print – but again I love both fabrics for other projects. The full list of bloggers taking part is below (with thanks to Jane, who had already pulled this together). I’ve loved seeing the projects posted so far and hope you have too. Categories: Sewing | Tags: big vintage sew-along, McCalls, pattern, retro, sew, sew along, Sewing, vintage, vogue | Permalink.